That was odd, even for Cronenburg. An interesting revisitation of Videodrome with shades of The Matrix and Inception, but hardly as pop-appeal as either. A pleasant surprise since Sword Art Online has conditioned me to think that any virtual reality based plot will automatically be a raging dumpster fire. Totally forgot about this beauty of a film until recently. 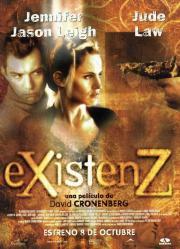 This is Cronenberg in a nutshell; freaky, twisted and thoughtful. The effects are so interesting and really add to the story. Loaded with a bunch of talented actors who really dive into their roles and make this a special flick.